I’m not qualified to call myself a cyclist. (I’m not even sure what word to use…Biker? Cycler? Cyclist?) I had heard about this bike share thing in Philadelphia, and I wanted to try riding a bike in the city…but, it totally intimidated me. And not just because I was nervous about angry drivers safety. You know when it seems like everyone else knows what the heck is going on, and you want to try something new…but you aren’t sure where to start? After my bike path adventures in Burlington this summer, I realized it was crazy that I hadn’t done any biking in Philadelphia, which is practically in my backyard. I had heard a lot about biking in Philly and the new bike sharing program. But because of the aforementioned intimidation factor, it took a little convincing (in the form of talking to myself). But a 75°F day in mid-October in Pennsylvania? I realized I had no excuse, and it was the perfect time to get all the info and experience it myself so that I could write a guide for any other first-timers out there who want to give it a try. Apparently, Philly has had a lot of bicyclists for decades, and the city has been making an effort to become more bike-friendly in recent years. From bike lanes to open street days, biking in Philadelphia is becoming safer and more accessible for everyone. And with the Indego Bike Share program launched in 2015, biking around the city is now an option for the millions of people that visit Philadelphia every year. Not only is it a really fun way to see more of Philadelphia in less time, it’s a healthier and more sustainable way to travel. The logistics of using Indego are actually pretty simple. Find an Indego bike station near you. You can see the map of all the stations here, but I highly recommend downloading the Indego app for real-time information on where the closest stations are to your current location, as well as how many bikes and empty docks there are (I saw a few empty bike stations on the map). The payment kiosk is in the middle of the bike station. Follow the instructions on the screen to pay for your trip with a credit or debit card, and choose a bike (each dock is numbered, and you’ll enter this number on the screen). Note: You can also get a monthly pass ahead of time, and Indego will send you a key to use at the bike dock instead of the payment kiosk. Read more in the Cost section below. At the end of your payment processing, the kiosk will tell you that you have 30 seconds to remove the bike. The bike dock will start beeping, and you just pull the bike out of the dock. Note: I was a little confused when I tried this the first time. I tried pressing the buttons on the dock (which are for pass holders who have a key), and I pulled back but couldn’t get the bike out. So I went back to the payment station and did everything again (and chose a different bike), and this time it came out easily. Not sure what happened, but I wasn’t charged twice since I never got the first bike out of the dock. When you’re ready to return your bike, find an Indego station with open docks (again, the app is useful in case there are full stations). The instructions are on the handlebar of the bike, and they’re really simple. Just push the bike into the dock, and you should hear 3 beeps to confirm that your ride is complete. From shared lanes to bike lanes and buffered bike lanes, as well as trails intended solely for bicycles and pedestrians, there are a lot of ways to ride a bike around Philadelphia. Since I’m such a newbie, I started off with biking the Schuylkill River Trail (past the art museum and Boathouse Row and towards Fairmont Park). This felt much less intimidating than riding on the road. While I got a little confused in spots where the trail intersected with busy roads, it was pretty easy overall. And it was such a fun, different way to see some familiar sights. I definitely recommend using a bike map–it can be found online here (PDF) with some of the Indego stations marked (though it’s really small when you print it! ), and I was able to pick up a paper copy at an information center on the Schuylkill River Trail under the Walnut Street Bridge (though it’s from 2012 so may not be up-to-date). Philly also has a great public transportation system called SEPTA, and it’s bike friendly! You can take bikes on buses, trackless trolleys, and some subways and regional trains. But depending on timing and location, it might be just as efficient to return your Indego bike to a dock near your current location, ride the bus or train, and then get a bike at another Indego station in that neighborhood. If you are going to take a bike on public transportation, read up on SEPTA’s rules and tips for bicycles here. Pay per trip–This is probably the simplest way to pay, especially for visitors. You just walk up and pay with your credit card. But it’s also the most expensive option at $4 per half hour. Yearly pass–You still pay per trip, but with a yearly IndegoFlex pass ($10 for the entire year), the per-trip price is cut in half to $4 per hour. Monthly pass–The monthly pass is $15 per month, and you get free unlimited 1-hour rides. After 1 hour, it costs $4 per hour. Indego passholders also get bonus coupons and perks (like discounts at the Philadelphia Museum of Art or Eastern State Penitentiary), and you can cancel your pass at any time. When you purchase a pass, you’ll get the key in the mail in 5-7 business days. Check out the Indego site to purchase a pass. BYO helmet–You can’t get a helmet at the Indego stations, so you’ll either need to bring one or purchase one locally. Helmets aren’t currently required by law, but really, why wouldn’t you wear one? Know bike laws, signals, and symbols. It’ll make you a better driver to review this information, too! Check out the Resources section below for all this info. No headphones allowed. This one is a bummer for me because I love listening to podcasts (pretty much always), but it’s against state law to use headphones while biking. And after seeing how busy the Schuylkill River Trail was, I realized I wouldn’t have felt safe with that distraction in my ears. If you’re really nervous about city biking, consider just using buffered lanes or multi-use trails. These are color coded on the bike map. Bike-Share Comes to Philly With the Launch of Indego from STREETFILMS on Vimeo. 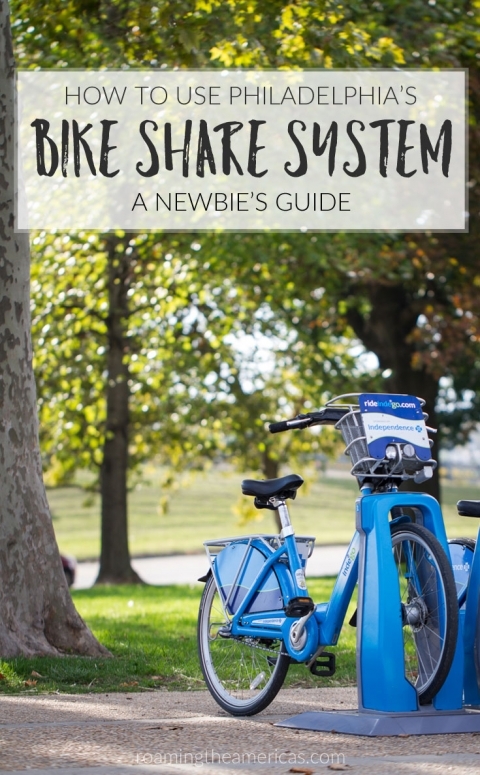 Indego–All the details, FAQ, and up-to-date information about renting bikes from Indego Bike Share can be found here. Bicycle Coalition–Download a bike map PDF, and review bike laws, symbols, and signals at the Bicycle Coalition of Greater Philadelphia. SEPTA Bike and Ride Policy–Get the details on where and when you can take your bike on public transportation in Philadelphia, and watch quick videos about how to load your bike. Connect the Circuit–If you want to bike even more around the region, check out one of America’s largest trail networks, the Circuit Trails in Greater Philadelphia. Get the circuit map here for updated information about existing, in progress, and planned trails. Would you (or have you) tried bike sharing in a big city? Let me know in the comments! Has Philadelphia Made A Bike Share That Can Get The Entire City Biking?